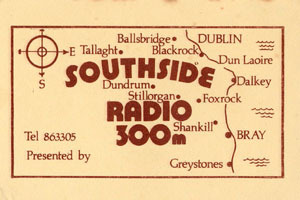 SOUTHSIDE RADIO was another one of the first of the early MW pirates coming out of Ireland that was quite widely heard in the UK. 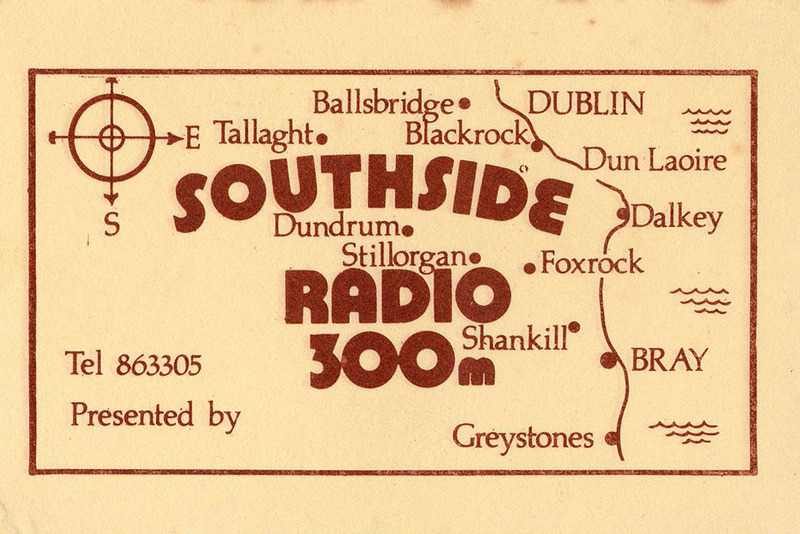 The station began it's life in the Dublin Mountains, broadcasting to Bray and South Dublin, before moving into Dunlaoire. 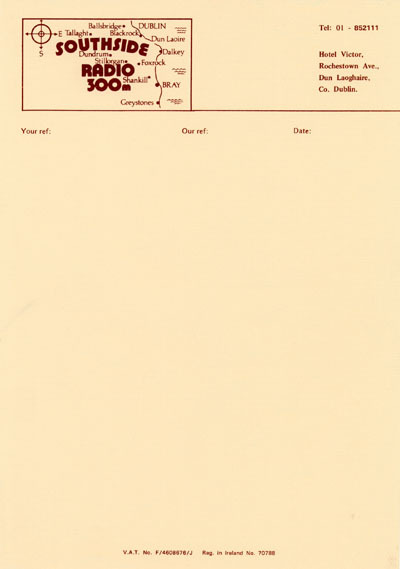 By then the location was the Hotel Victor, Rochestown Avenue. The place is still there, although renamed the Rochestown Lodge. SSR had a radio enthusiast as a presenter and PR man. Marc Bolland had been the presenter on the FRC Ireland show on a Sunday morning, which was carried via Westside Radio as well as Radio Condor, both on SW. As a result, SSR were very widely heard via these SW relays. Marc also presented a few shows for SW pirate, Radio Mercury in the late 1970's. His voice was often heard on the Westside Radio jingle package around that time, and even years later, when Marc had long disappeared from the radio scene, his voice lived on. One oddity was that Prince Terry of Westside always referred to Southside Radio as Radio Southside, and as though in reciprocation, Mark's jingles he made for Prince Terry named Westside Radio as Radio Westside.. LOL!! For some reason, during 1981, both KELO and Southside Radio tried 1566kHz. 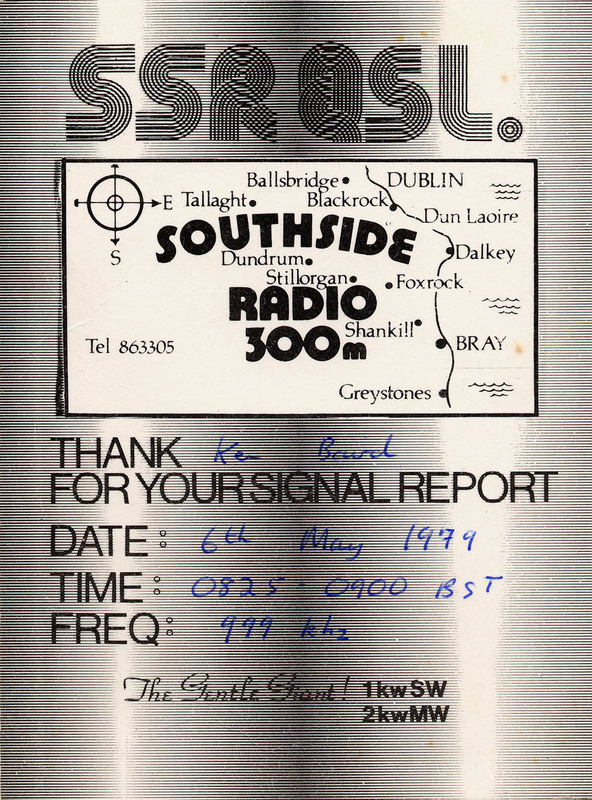 SSR were noted for the first time on Sunday 26th October 1981 on 1566kHz, but signals in Scotland were way down on the usual powerful 999kHz. 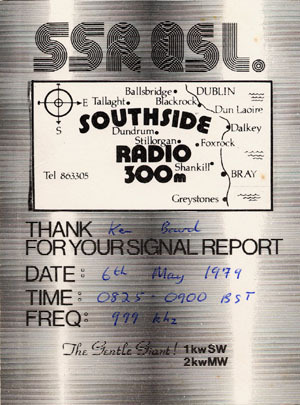 (KELO signal was also poor during their brief visit to 1566) At this stage Red Rose Radio in Preston was not on the air on 999, so what the reason for the SSR move was is anyone's guess. A possible explanation was given on the FRC show that day, which incidentally was announced as Mark Bolland's last FRC programme. It was said there was a more powerful transmitter being used on 1566. One can speculate, but wasn't the ET working fine at one stage on 999?? Or was it always another txer on 999?? The same day, the weekly relay of the FRC show was not aired, due to word of the freq move obviously not reaching Prince Terry, and Diamond Radio was heard being relayed on 6280. But while fiddling with the tuner around the Diamond freq, Prince Terry discovered SSR on 1566!! I wish we had Perseus files (wideband recordings of the full mw band) during these exciting times, when every week had it's own news of frequency changes or new transmitters etc. Staff on SSR included Steven Bishop, Tony Allan, James Kaye, (all of Caroline) Paul Nicolas / Andy Rue, and another UK presenter who used to be on the VOP. See sched on the ad rate card below. See an early SSR Advertising rate card in pdf format. 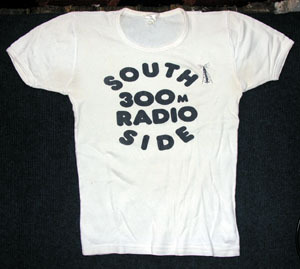 SOUTHSIDE RADIO produced the above T Shirts at one time. This was won by Ken in Scotland for being the farthest away listener on the MW service during the FRC Show (Free Radio Campaign) one particular Sunday morning. The shirt was tiny. Small was thought to mean that it would be tight, but not tiny!! So it is one of the few T Shirts in the radio collection that is in good condition. 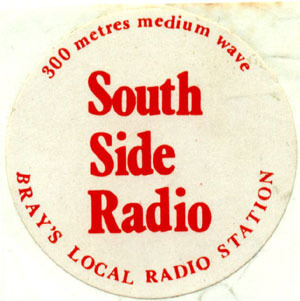 It is also well remembered the everyday people, ie non anoraks, read this as SOUTH, 300M, RADIO SIDE!! What's all that about they used to ask, the few times it was worn!! The wording is certainly badly spaced!! The promotional material below all expands with the click of a mouse.